A few years ago, my mom went out to Arizona to visit part of the family out there. Mom brought back a tile (bottom in the above picture) that my great grandmother made. It’s hanging in my kitchen. Since then, mom has bought me other Potter — Beatrix, not Harry — stuff (one is the top in the above picture). Quite a collection. Funny since I’m not much into “cute” stuff. But I’m much into family history and art stuff! Wouldn’t it be neat to make a new tile? There’s a ceramic shop around here, or there was. I could paint a tile up — maybe? — and glaze it. Dunno. Just an idea. 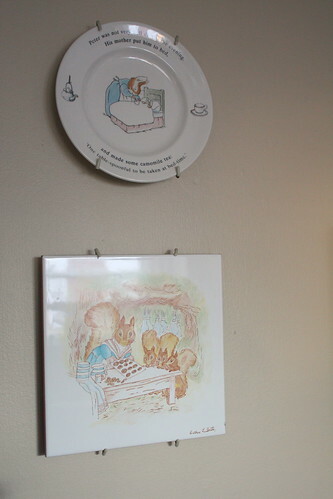 I have some of my grandmother’s ceramics around the house too but she never did a tile. The past few Thanksgivings have had a common theme: We should go do something. There are many reasons for the volunteering on that day. One, less time with family. Oh! No, she didn’t! Yes. Yes, I did. Also, it’s a day a lot of people have off so it’s easier to coordinate a family volunteer day. Are you still judging me about spending less time with family? Fine fine fine. Moving along while you judge. Recently, I visited the local volunteer expo and saw many ideas for “giving” on a holiday. 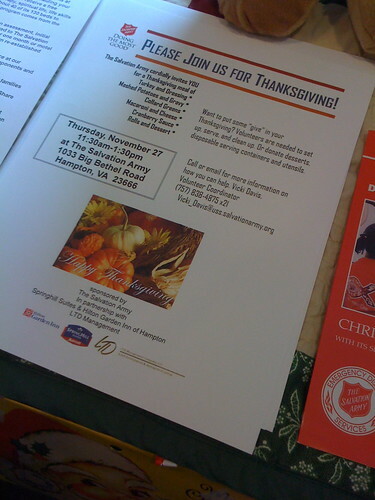 I’m sure not just my local Salvation Army is doing this. Right? 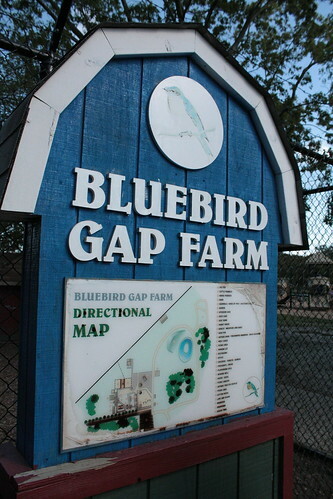 I contacted Blue Bird Gap Farm, a local city-run farm, and asked about a volunteer day there. They’ll take any help they can get. So, that’s what I’m doing! I’m gathering up those with good backs and helping out there. I was told they can use help painting and winterizing. That sounds perfect. What do you do for Thanksgiving? What about winter break? For mother’s day, I made lasagna. I was given the choice to cook whatever so I started making the spaghetti sauce and then asked which is preferred. Neither. 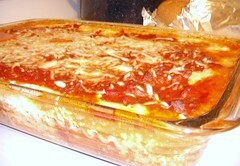 So, I took some sauce and froze it and made lasagna with the rest! Best of both worlds. Also, I cut up some of the lasagna and froze it. I can’t wait to pull it out at a later date! I have no idea how to cook it but I’ll figure it out. 🙂 Sorry so late in posting my dinner but I got distracted. I don’t use many noodles… maybe 6. I’ve tried this a few ways and found that the wine wasn’t a deal breaker for me. It seemed such a waste to use just a little bit of a bottle and the bottle sit around unfinished forever. I also use more garlic… probably around double what’s called for. When I want it spicy, I use two pounds of Johnsonville Hot Italian Sausage. When I want a little kick, I just use one and the rest can be homemade turkey sausage or mild. I’ve made this with just one pound of homemade turkey sausage and it was good. I went for the full hot kick for mother’s day. I looked all over for a frozen loaf of bread that I would thaw and cook but couldn’t find one. I grabbed a fresh baked loaf from the deli. Near the end of the lasagna baking, I put the foil-wrapped loaf in the oven to warm up. Better than nothing! I love this stuff! I use barely any olive oil so it’s basically me dipping the bread into an herb mixture. 😉 Mom preferred butter. Fine with me! More herbs for me. I have found that fresh parsley is much better in this than dried. The rest of the herbs I use are dried. I just stir it some finely diced parsley in with the rest of the herbs. I don’t pulse it or anything. I also use more garlic than called for… of course. I’ve noticed how much the olive oil matters. I couldn’t find the kind I used before so went for a light one. Not the same. I think the one before was in a dark bottle and labeled for dipping. Bag o’ salad greens, cucumbers (had to peel cause she had the non-English one), roma tomato, etc. Balsamic dressing. At least the rabbits are eating healthfully tonight…. So. Yeah. Since I knew I’d be packing for the trip tomorrow and finishing my project before I leave, I stopped off at the local grocery store and picked up a …. pizza. What! Don’t judge. 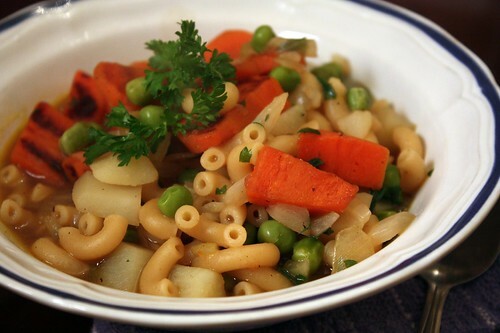 And since I cleaned up the fridge of veggies that meant no salad even! But when I emptied the trash as the oven preheated, I ran into two rabbits. After conversing a bit, I went back inside and grabbed my camera. They munched away happily on the plants and let me photograph them though I didn’t get as close as I was when I took out the trash. I want them to continue to live there. 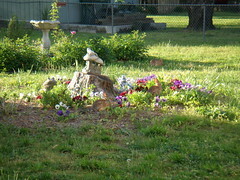 Last year, I had a lot of rabbits in the yard and would love to have a family again. I’m sure my neighbors thought I was nuts since I was taking pictures of my yard from the side and making little reassuring noises. 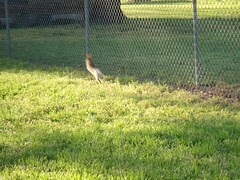 Maybe that’s why the rabbits didn’t run — they thought I was nuts and were entertained. After snapping pictures of the two, another appeared from under my shed. Three rabbits! He or she slowly joined the other two and I tried to get closer. I guess I got too close and — WHOOSH! Talk to the tail! So. Yeah. I fixed pizza. I ate pizza. But at least someone in the “household” eat healthfully. Rock on, bunnies, rock on. You’re an inspiration.